In this article, You can find the step by step guide to set browser homepage on Android supported devices such as phone, tablet and so on by typing content://com.android.browser.home/. I went to Amazon to shop for a new Android smartphone as gift to my niece recently. The phone is not as high end as Samsung Galaxy phones but it has all the necessary features and is priced at a reasonable price range. The only issue that I face is that it does not provide any way to modify the stock Android browser’s homepage. The homepage is the site of the manufacturer and there is no setting to change the homepage (the manufacturer maybe deliberately do this). When I perform a search on Google, I discover that most low end Android phones will only display the manufacturer homepage on the stock browser. However, I did not just give in on changing the homepage but I found multiple ways to change this in the end. 2. Tap the Menu button below the screen. 3. Scroll all the way down and select Settings. Android Browser settings option. The following is a step by step instruction on how to change the homepage of your stock Android browser if you cannot find any setting to do this. 1. 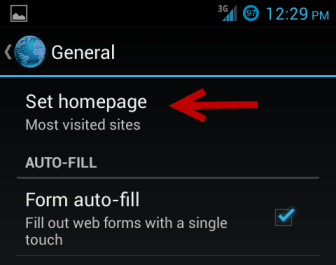 Access the site that you want to set as homepage in the Android browser. When you are on the site, press the menu button, which is the left button on the smartphone edge. 2. A menu will pop up and you are to choose Save to Bookmarks. There should be no changes made to other options. The site is to be saved to a local account in the Bookmarks group. Finally, you can tap the OK button to save the setting. 3. Now, you must press the menu key again and select Bookmarks/History. 4. Look for the site you just saved and tap on it. When a menu pop up, you must choose Set as homepage to set it as the default page of the browser. It will show a confirmation that your default homepage has already been updated. Now you know this simple trick on how to change your homepage on your Android phone. All you need to do is to save the website you want to set as homepage to bookmark and go to the bookmark/history to set it as homepage. Changing the homepage of your Android phone will take less than one minute.